How do I clean the laminator rollers of my DTC 4500? My DTC 4500 won�t communicate. Open the Printer�s Ribbon Drawer, remove the Print Ribbon and close the Front Cover. Periodically, use a Cleaning Pad from the Printer�s Cleaning Kit to remove dust and other contaminants from inside the Printer. Remove the lamination cartridges from the laminator. Scroll down to Toolbox and press the Pause button. Scroll down to Clean Laminator and press select. 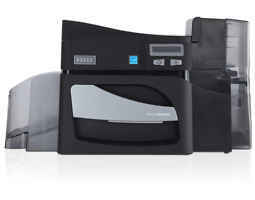 Insert a cleaning card into the printer. Sticky side down. The cleaning card will be pulled into the laminator. The card will be transported back and forth over the rollers and then be ejected. Check the following and press the Pause button to continue.